We now start the OO leg of our F# journey, where we will look at how to create classes (generic classes too) and use OO things like inheritance/interfaces, and we shall also look at how to use events within our classes, and how to use reflection to do meta programming against our classes instances. Let’s have a look at these 2 points in a bit more detail shall we. So for point 1, what does that really mean? So if I have some code like the example shown below, is it valid? The answer is no….And why is the answer no? Well it is due to the fact the Person type is declared within the main method, which is not valid. As previously stated a type must be declared in a module, so to fix this we simply need to move the type to a dedicated module. That would fix point 1. 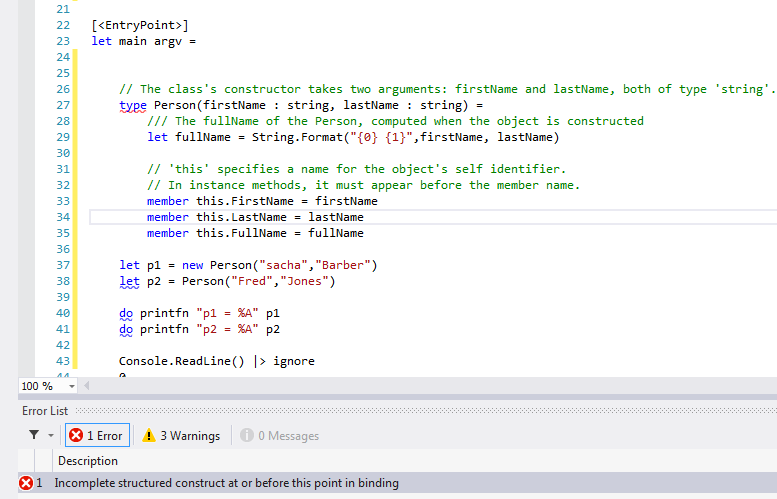 The let and do bindings in a class definition form the body of the primary class constructor, and therefore they run whenever a class instance is created. If a let binding is a function, then it is compiled into a member. If the let binding is a value that is not used in any function or member, then it is compiled into a variable that is local to the constructor. Otherwise, it is compiled into a field of the class. The do expressions that follow are compiled into the primary constructor and execute initialization code for every instance. Because any additional constructors always call the primary constructor, the let bindings and do bindings always execute regardless of which constructor is called. Fields that are created by let bindings can be accessed throughout the methods and properties of the class; however, they cannot be accessed from static methods, even if the static methods take an instance variable as a parameter. They cannot be accessed by using the self identifier, if one exists. Types may also have other constructors that MUST call the primary constructor, this is easily done using the new keyword which may be an empty constructor, or may take arguments. printfn "let p1 = new Person(\"sacha\",\"Barber\")"
From VS2012 onwards F# supports auto properties, which you can use to simplify your code, here are some examples of how you can use that. Access modifiers are generally put in front of the name of the entity. If no access modifier is used the default is public except in the case of let bindings in a type, which are always private to the type.